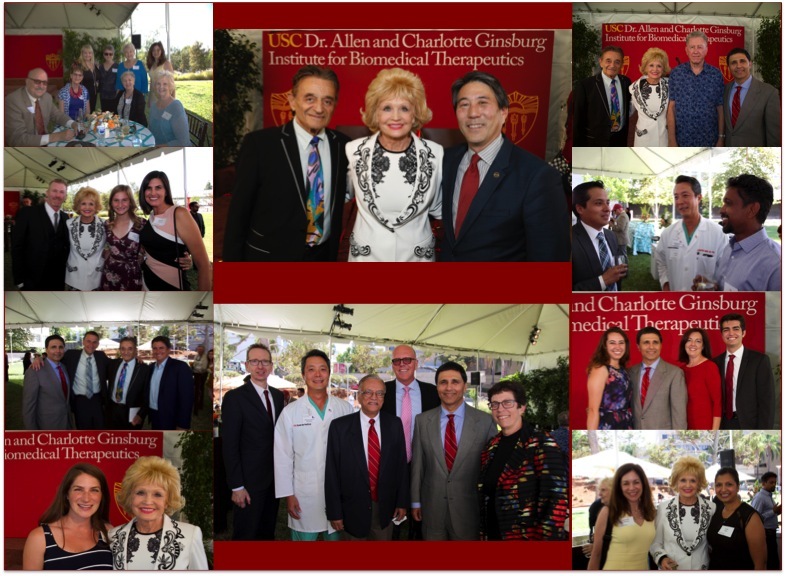 Celebrating Dr. Allen and Charlotte Ginsburg and their extraordinary $10 million gift to establish a research fund and name the USC Dr. Allen and Charlotte Institute for Biomedical therapeutics. 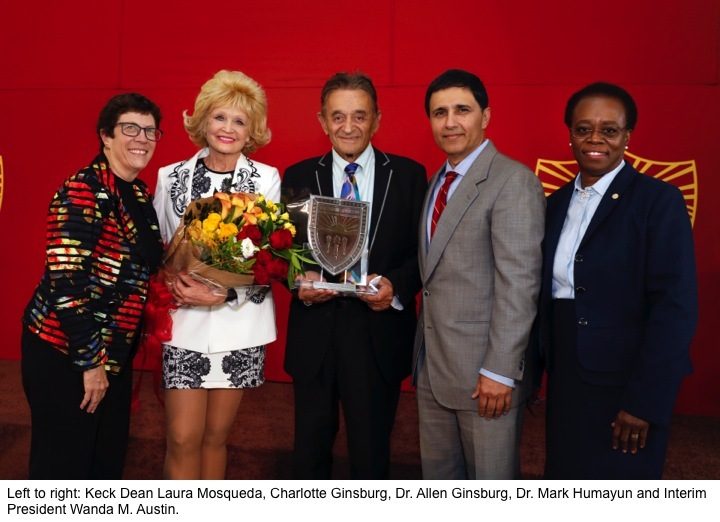 A USC celebration was held in August to honor Dr. Allen and Charlotte Ginsburg who generously donated $10 million to support innovative research at the USC Institute for Biomedical Therapeutics for debilitating neurosensory diseases. 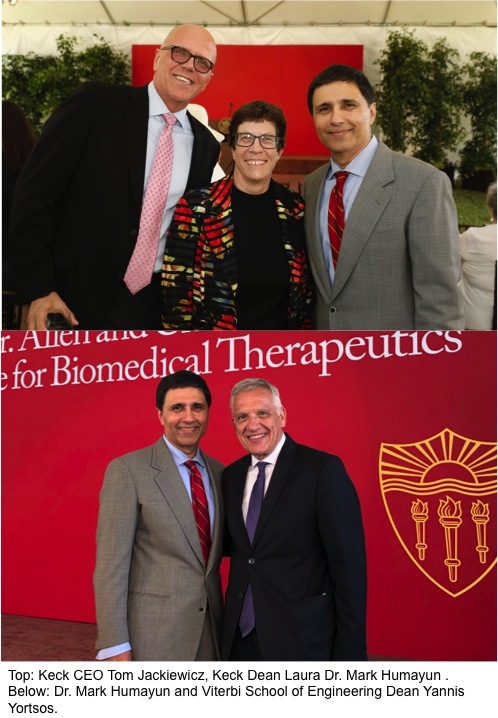 In recognition, the institute was named USC Dr. Allen and Charlotte Ginsburg Institute for Biomedical Therapeutics (IBT) and is led by Director Mark Humayun MD, PhD. The Ginsburgs were joined by friends, family and special guests; new Interim President Wanda Austin, Provost Quick, Tom Jackiewicz, CEO of Keck School of Medicine, Deans Laura Mosqueda and Yannis Yortsos. “I am incredibly grateful for Allen and Charlotte and their generosity, creativity, foresight and entrepreneurship and delighted to be celebrating them and this extraordinary partnership today,” said Humayun when speaking to the audience. USC Ginsburg IBT’s vision lies at the interface of medicine and engineering, transforming bioengineered neural interfaces into treatments for patients who suffer from the most debilitating neurosensory disorders. Research breakthroughs by Dr. Humayun and his team of experts include the development of the first FDA-approved artificial retinal implant, Argus II, and stem cell-based treatments for devastating eye diseases. 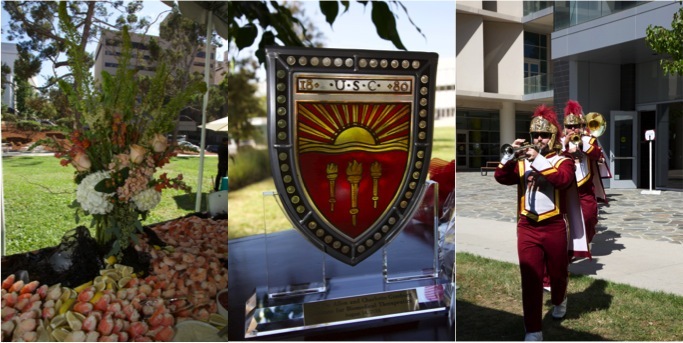 The USC Ginsburg IBT advancements thus far have been the result of multidisciplinary collaborations primarily through four schools at USC: the Keck School of Medicine of USC, the Viterbi School of Engineering, as well as the USC Dana and David Dornsife College of Letters, Arts and Sciences and the USC School of Pharmacy. Additionally, unique partnerships between educational and research institutes outside USC as well as industrial partners around the world have resulted in a multitude of successful collaborations. Along with this extraordinary gift, The Ginsburgs have always given back to their community through numerous philanthropic initiatives. Dr. Allen Ginsburg, a retired ophthalmologist and Charlotte Ginsburg, a philanthropist, have supported causes such as environmental sustainability, ocean aquaculture and desalination of seawater, and are also involved with the Aquarium of the Pacific, Palos Verdes Land Conservancy and Save the Redwoods. Humayun noted that Dr. Allen and Charlotte Ginsburg’s private philanthropy would help establish critical “proofs of science”, get big ideas off the ground, and create incredible return on investment namely saving and restoring sight. The gift will also support research at the institute and a biennial scientific meeting of physicians and researchers to discuss new ideas and breakthroughs. At the meeting, organizers will award the Ginsburg Vision Research Prize to the team or individual whose work shows the most promise in finding a treatment or cure for eye disease. Enthusiastically, the Ginsburgs share IBT values in educating the workforce of the future and recruiting and retaining the best minds in science. To learn more about the USC Ginsburg IBT’s latest innovations and discoveries please visit ibt.usc.edu.